Although I went into the film with a few spoilers (having listened to a movie review podcast and seeing a few questions on SciFi.StackExchange) I was surprised by the amount of information I didn’t already know. 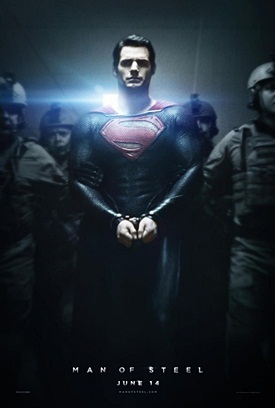 Man of Steel gets arrested after numerous FAA violations. Man of Steel presents a more science fiction origin to Superman than we have previously seen in films. In the comics and cartoons we know that Krypton was technologically advanced and Superman reaps some of the benefits of that, but in the movies the Kryptonian technology seems to be based primarily on crystals and their ability to make houses. In Superman Returns Lex Luthor captures some crystal growing technology and attempts to create a new continent. When asked how he is going to defend it he says he’ll use the advanced technology. Considering it is just him and his idiot henchmen, I have no confidence in his ability to do this. I have great confidence in Zod, because with Man of Steel the technological superiority of the Kryptonians is obvious. Also, they are all supermen. Superman’s powers are giving a slight polish to the established canon. Having evolved from a significantly harsher planet, Kryptonians on a whole are highly adaptable. Martha Kent describes the baby Clark Kent as wheezing and coughing through the night as his lungs tried to process Earth air. He gains super strength and speed from the Earth’s young sun. His additional abilities of x-ray vision, heat vision, and telescopic vision are a result of the Earth’s atmosphere. Superman now loses some powers when he is removed from that environment (somewhat… inconsistently). Hopefully the great Superman powers race won’t begin where in every new movie he needs more and more ridiculous abilities (I’m looking at you, Superman IV). For the first time on film we see the super speed and destructive strength of a super charged Kryptonian at work. The almost teleporting nature of the attacks is what I imagine The Flash would look like. Speaking of other characters, there are at least two Easter eggs in the film. One referring to Lex Luthor and another referring to Wayne Enterprises. With the exception of the Easter egg billboard in I Am Legend I am not aware of any cross references between any DC heroes before in the films. Everyone knows that DC and WB would love to see the same kind of money from a Justice League movie as Marvel did with The Avengers. Green Lantern didn’t do well, but maybe if Man of Steel does extremely well JL will still happen. If DC wants to do an origin story for every member of the Justice League they still need to do 5 (Flash, Wonder Woman, Aquaman, Martian Manhunter, and presumably Batman). What did I think of it? I felt the movie was fairly slow throughout the middle. The intense action scenes at the start and end seemed to compound the feeling on nothing happening in-between. I find myself frustrated by the mentality of Hollywood that every super hero must reveal their identity on screen (or at all). Batman has told so many people that he is Bruce Wayne he has probably just started printing it in on this business cards. Sadly the same may be true for poor onscreen Superman. The action of the film was both amazing and horrifying. This isn’t the same kind of Superman we saw in the 70s and 80s. I walked out thinking the movie was okay. Major Stackings asks How do the wand makers get the cores into the wands? One comment suggests that secret is in using molten wood. sarge_smith noticed that troopers go in, but nobody comes out in his question: Where’d those guys on the Millenium Falcon go? CL4PTR4P asked Why is Janeway an Admiral and not Picard? Iszi wondered Which actor has portrayed the most distinct roles in the Star Trek universe? The most controversial question (asked by Sachin Shekhar) was: How big is the Matrix? The question which got the highest score (asked by KennyPeanuts) was: Why was Scrooge chosen for redemption? The question which got the highest voted answer (asked by Kevin Howell) was: What are Gandalf’s powers?